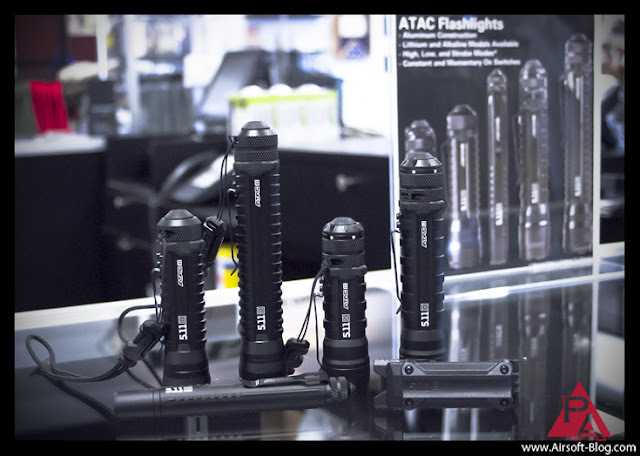 I happened to come across an opportunity to get a hands-on introduction to the new ATAC Flashlights from 5.11 Tactical two weeks ago and luckily I had my camera with me like a good little Pyramyd Airsoft Blogger. So I snapped off a shot (with permission) of the five new torches from my favorite tactical gear company. They are not the final production models, so some features (form or function) may change between the time this photo was taken and the time they are released for sale to the public. I am told from a most reliable source that at the time I took the photograph, this was one of less than five sets in the world. Talk about bein' at the right tactical place at the right tactical time! WOW! From left to right, in order of brightness (in terms of lumens), with the brightest of the lights being on the very right at around 220 lumens (subject to change). Lying down in front is the LED pen light, alongside the belt clip holster, which will also attach to MOLLE web platforms as well. All of the bodies on these lights are quite thin, around an inch in diameter, which will actually allow you to use a standard 1 inch scope ring and mount the light to your favorite Airsoft gun. These lights also feature a strobe function, in addition to a high power & low power light mode. The only downside at present is that I don't believe these lights will accept a remote pressure switch for running them on your weapons, but I see guys running tac lights on their guns without the remote switch all the time, so it certainly can be done if you set it up properly. Another thing I'm liking about these lights is that even their top of the line model is only going to go for around $80 or $90, if I'm not mistaken. So they will have attractive price points for a lot of different wallets out there, which is always nice. Alright. That's all for now.